I drove by this sale while on an errand just minutes from our house. On the way back, I noticed a SNES sitting on a table, so of course I had to stop and take a look. 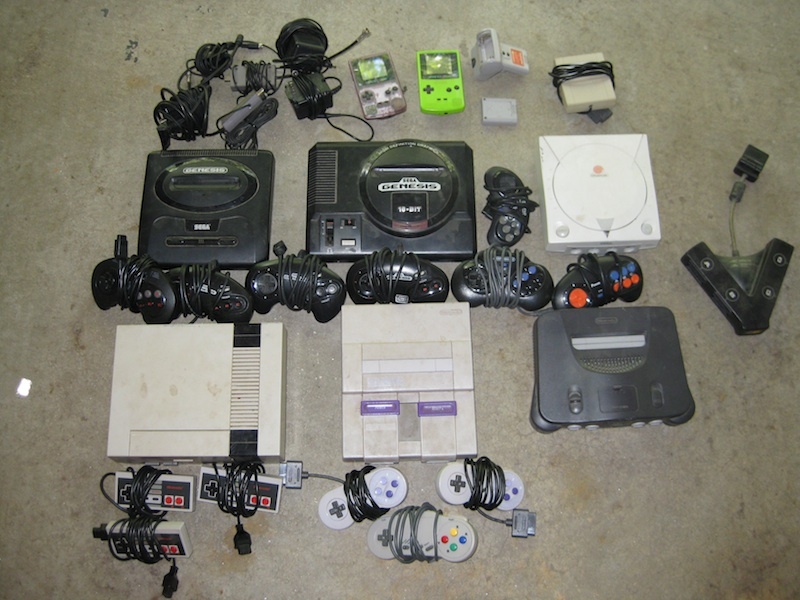 There wasn't just a SNES, but several more systems and a bunch of games. A potential big score. I asked how much for the games while looking through the NES pile. The woman counted the games, which at first worried me. She said "$5". I said, "$5 for all?" choosing my words carefully. You never want to suggest "each" because you never know what they are thinking. She said yes. A good sign - they were asking reasonable prices. I decided to go for broke and asked how much for everything. The husband and wife running the sale thought for a moment, then came back with $20. Definitely reasonable, considering how much was there. There was only one problem. I had no cash on me! One of the most important yardsale rules is to always have a supply of cash on-hand. Even if you aren't out 'saling, you never know what you'll stumble on. I told her I had to get some money and would be right back. Again, I broke another rule. Never leave behind a potential score. You never know if someone will slide in during your absence and grab it. I swung by the house which was just a minute down the road to pick up Dom, and together we raced to the nearest ATM...nearly 10 minutes away. Of course, the whole ride we were imagining that when we got back, everything would be gone. Fortunately, we were lucky. The bundle was completely untouched. We tried to politely haggle it down to $10, but she was firm at $20. Had I had cash on me the first time around, there was a better possibility for talking down. But when you come back, the seller automatically has the upper hand. $20 was certainly reasonable for the amount that was there. I had expected her to start at a much higher price. 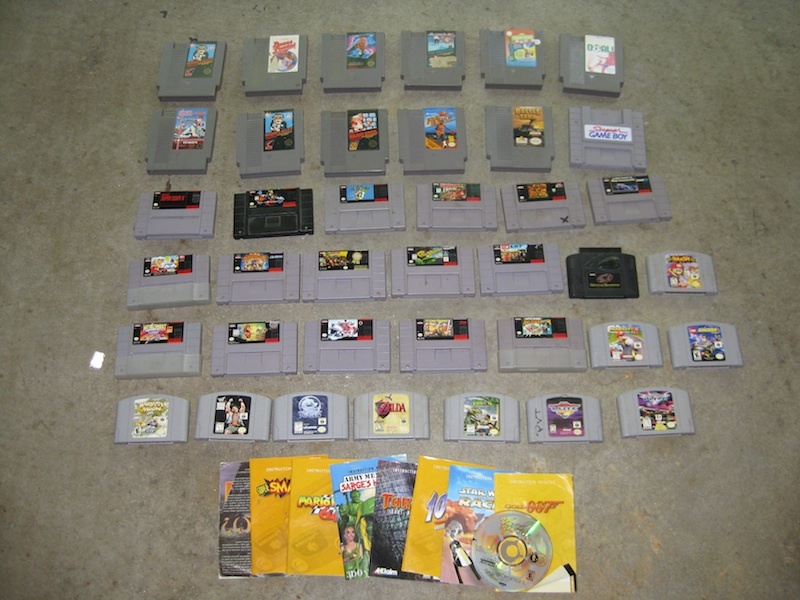 Since good game scores are hard to come by around here, and it's been awhile since we've picked up anything, we were fine with paying the $20. We went through everything when we got home. 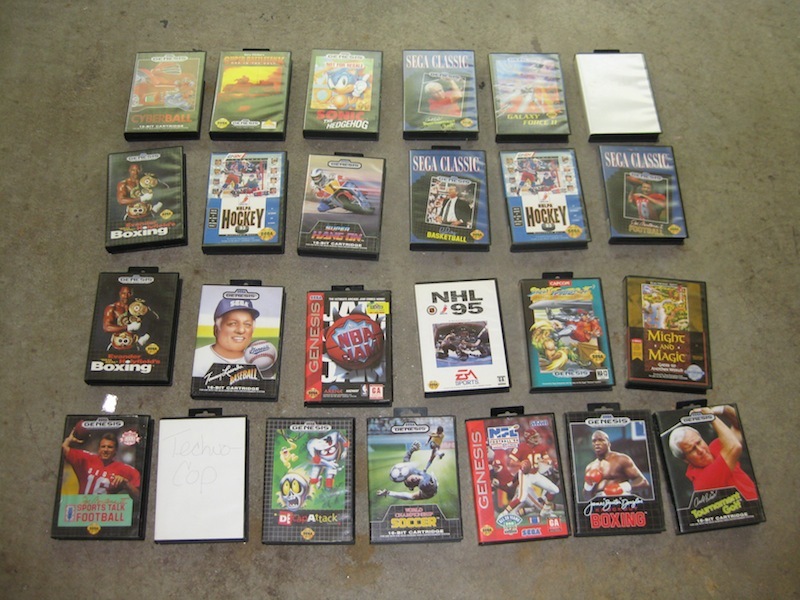 Sadly, most of the Genesis games were sports titles, which soured the deal just a little. The only "gem" in the entire bundle was Harvest Moon 64, which we did not have yet. Also included was Frogger, the final game released on the SNES. There seemed to be a lot of things "missing". Even though there was a Dreamcast, there was only 1 game (in the system). There were also some Super Scope games, but no Super Scope. Two Game Boy Colors and no games. Several manuals but no games to pair with. We wondered if those items were sold at previous sales or taken by family members, or even still down in their basement. Later in the day, we stopped by a thrift store that we had passed many times before but always forgot to check out. Though we didn't buy anything, the placed was packed to the gills with all things old. It's definitely a place worth checking out every so often. We found a NES game tucked away on a shelf (NES Play Action Football, already have a few copies), so there's a possibility for video game finds. Pretty nice haul. I would consider Super Adventure Island 2 and Sim-Ant as gems as well.